“The Bow Street Runners were the earliest form of detective force operating from the courts to enforce the decisions of magistrates… In 1763 John Fielding introduced the Bow Street horse patrol to make the highways around London safer. Funding lasted for only 18 months. 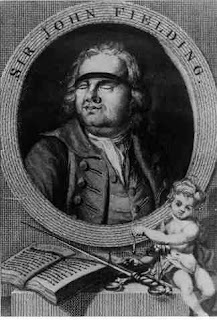 He also became responsible for street lighting and lamp posts in an eighteenth century initiative similar to more modern moves to link street lighting with crime prevention.” Click here for more on this topic. “One other action which brought about a reduction in crime was the revival in 1805 of the Bow Street Horse Patrol. This consisted of about sixty men whose duty it was to protect travellers on the principal roads whithin sixty miles of London. They were selected with care, and many had previously served in a cavalry regiment. On the main roads, as far out as Epsom, Romford, Enfield and Windsor they created confidence with their clearly spoken greeting, ‘Bow Street Patrol.’ Their single most successful achievement was to rid Houndslow Heath of highwaymen.” From The Regency Underworld, by Donald A. Low.